The TARDIS HAD stopped. The time rotor was still. The engines were in ‘parked’ mode. But they were still rocking and pitching as if they were on a boat being tossed around by a wild, angry storm at sea. 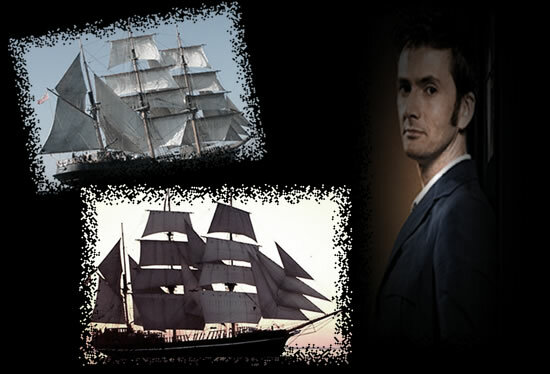 “We’re on a boat, being tossed around by a storm at sea,” The Doctor announced as he gripped the handhold on the console tightly. “STOP talking about sick,” Wyn yelled and then made a dash for the inner door of the TARDIS, wishing fervently that the bathroom was not such a long run from the console room. Jasmin managed another thirty seconds before she made a run for it as well. “If they don’t make it, you’re on cleaning up duty,” The Doctor told Alec. “Oh, please, no,” Alec answered. “Cleaning up sick always makes me sick.” The Doctor grinned a grin that clearly implied ‘Serves you right.” Alec decided to change the subject. “Right, so you’re an expert on eighteenth century sailing ships?” Alec said. “I think we’ve had enough of that for the time being,” Alec told him ruefully as the girls returned from the bathroom looking decidedly ruffled. The Doctor repeated his information, leaving out the explanation of Square Rigging and the bit about his personal acquaintance with Admiral Nelson. “Or your instruments could be wrong and this IS the eighteenth century,” Alec suggested. The air, in fact, was TOO fresh to do anyone any good at all. There was a gale blowing. The Doctor irritated everyone by being able to tell them by putting a finger up that the wind was coming from the south-west and it was force ten on the Beaufort Scale, and officially not a gale but a storm. “Wrong everything,” Wyn commented as she looked at the people who were trying to bring the sails in and control the ship while horrendous looking waves threatened to engulf it. They were definitely NOT eighteenth century sailors. Not unless denim jeans were invented in the 1790s. There WERE some people who looked like eighteenth century sailors, but they didn’t seem to be doing anything except trying to keep dry and keep out of the way of the ones who WERE working. “Who are you?” somebody asked. It was one of the eighteenth century sailors who had been too busy being ill to notice that he was doing so up against a 1950s police box. “Stowaways,” The Doctor replied. “Who are you?” But the answer was lost as a scream rang out above the roaring of the force ten storm. The Doctor looked up to the top of the foremast and saw a man hanging by one leg that was tangled in the rigging. Another man was trying to reach him but he looked in imminent danger of falling himself. The Doctor didn’t hesitate. His friends watched in amazement as he threw off his coat and jacket and began to climb the mast as if he was a professional sailor. Wyn and Jasmin both forgot to be sea-sick as they watched the wind buffeting him and the angle of the mast changing moment by moment as the ship broached the high waves. “Oh my God, he’s going to die,” Alec murmured. The Doctor didn’t like heights. But he was not afraid of them. He didn’t let the memory of that fatal fall that had caused his fourth regeneration stop him from doing what had to be done to save a life. “I think you’re probably right,” The Doctor said. “Just hang in there a minute or so more.” He looked up above him to the yardarm where the other man was lying horizontally and trying to cut the ropes that were tangled around the stricken man’s leg. The man continued cutting and The Doctor took the weight of the man fully. He pulled him across onto his shoulders in a ‘fireman’s lift’ and held him firmly but gently so as not to aggravate his broken leg as he slowly descended. He looked up and saw the other man coming down after him. He looked down and saw a crowd below all watching him. He was too busy worrying about the fact that it was still a long way down to take in the fact that the crowd seemed to come from two different historical periods. He was too busy getting down safely to notice that the storm had stopped. Just like that, the storm ended. The wind dropped, the sea calmed, the rain stopped battering him and the sun shone from a sky that was a uniform blue. “Here, we’ve got you,” somebody said as he reached the bottom of the mast and hands reached to lift the stricken man from his back and lay him down on the ground. “Get the first aid kit,” somebody else yelled as The Doctor knelt and began to examine his injuries. “He has a clean break across the tibula,” he announced. “There’s also a lot of damage to the anterior cruciate ligament.” He put his hands on the man’s forehead gently reaching in to block his pain receptors. The injured man looked up at him gratefully as one of his crewmates brought a first aid kit and begun to put his leg into a splint. The Doctor stood and looked around at the man who had spoken. He was dressed in twenty-first century merchant seaman’s clothes. Beside him was a man in the uniform of an Admiral of the late eighteenth century British Navy and another in a sweatshirt and jeans. He was holding a lens of the sort used by film directors to view a scene as it would appear through the camera. Behind him were two men in the same sweatshirts with the logo of a company called “Phoenix Productions” on the breast. One had a camera recording the events and the other a boom mike. “Yes,” The Doctor began to say. “Do you know….” One of the 21st century crew came running towards the captain. The Doctor heard him say something about the radio being off air. “Wyn,” The Doctor said. “Nip into the TARDIS and see what our position is according to the environmental console.” She nodded and ran to do as he asked. He turned and followed the captain as he went with his crewman to find out what was wrong with his ship. The director and film star were left on deck looking as if they were neither of them sure what they were supposed to do next. “Magenta Brown?” he said with a smile as he took her pen and the scrap of paper she had handed him. “I’m glad you liked it. “No, not that one,” she began. “I was thinking of….” She stopped and laughed to herself. 2015, The Doctor said. She looked at the actor again. He DID look MUCH younger than he did in the film she was thinking of, that was new out a couple of weeks before she and Alec met The Doctor in 2025. She looked around her at the sailing ship and at his uniform and ran through his film credits in her head and she realised that she had SEEN this film hundreds of times. She had it on DVD microdisc. And the two sequels. She had never REALLY appreciated what it meant to time travel until that moment. Captain Goss stared at The Doctor. His ship and its crew and clients were in some kind of trouble and he had an injured man who he couldn’t get any help for. Those distractions had so occupied his mind he had actually forgotten that The Doctor and his friends were not even supposed to be there. Goss had to concede that point. “The radio went off air forty minutes ago when the storm began,” the radio operator said. “In what?” Captain Goss demanded. “The Bermuda Triangle?” The radio operator laughed, but it was a laugh without conviction. It was hard to laugh at the most outlandish theory when he was sitting there with a radio that wasn’t even receiving white noise. “Glad you remembered,” Goss answered him. The radio operator and navigator looked at each other for a moment and then abandoned their posts to follow on. “….But it’s the 21st of May, 1588,” she added. “Er….” The Captain looked between the director and actor and wondered what they were talking about and why it had anything to do with his ship. “Look!” Somebody yelled and the crew of the Halcyon as one ran to the port side to watch with amazement the sight of the Spanish Armada, the ACTUAL Spanish Armada, sailing towards them. “What the hell is THAT?” Brian Worthing turned and pointed to the starboard side of the ship. The Doctor followed his finger and stared at the impossible sight of the sky half blue and in full daylight and half a clear starry night. The demarcation line between the two was sharp, as if two pieces of scenery had been spliced together. His crew responded, realising the urgency of the situation. The ship was quickly turned about and they raced under full sail towards the dark side. “I don’t. But we don’t have much choice. Let’s get out of the frying pan and I’ll worry about the fire afterwards.” He turned and headed towards the TARDIS where it was parked amidships. Wyn, Jasmin and Alec all followed him as a matter of course. So did several other people. 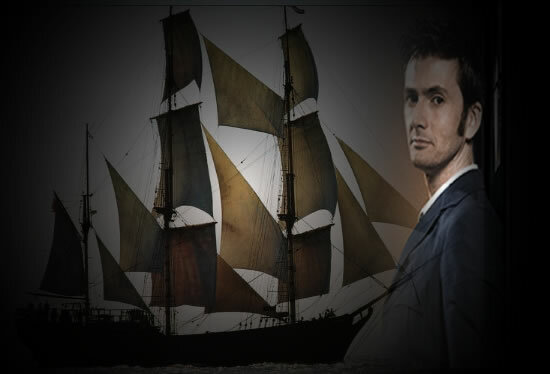 “We’re about to be hit by cannon fire from the Spanish Armada,” Alec pointed out as The Doctor turned on the viewscreen to show them racing towards the dark part of the sea pursued by three Spanish ships. They saw cannon balls flying through the air, missing the Halcyon by inches. The TARDIS crew and guests watched the viewscreen in near silence as the Halcyon reached what The Doctor had called the ‘seam’. They held their breath as the bow of the ship crossed from the bright day in 1588 to the dark night ahead of them. Somebody on the bridge had used some initiative and the bow light came on. They could see it in the darkness ahead as it quickly engulfed the whole ship. For a brief moment as The Doctor reversed the view they could still see the daylight of 1588 and the Spanish Armada in pursuit. And then, in an eyeblink, it was gone. One last cannon ball fell with a splash a few feet away from the ship and they were in darkness on a calm sea with a starry sky above. Not alone though. Captain Goss gave a sudden cry and ran for the TARDIS door. “I have to SEE this!” he yelled as he wrenched open the door and ran outside. Everyone followed, The Doctor last of all, closing the TARDIS door behind him. “Oh my….” Wyn murmured as she went to the rail and looked out over the dark sea. Not an empty sea. They were far from alone. “It’s June 6th, 1944,” Captain Goss told her before The Doctor could begin to speak. “Get our lights out,” Captain Goss whispered loudly, his voice carrying on the night air all the same. Somebody at once ran to the bridge and ordered the bow lamp and the other lights around the ship to be turned off. The rest watched in awe as that other Armada slowly passed them by, unaware that they weren’t part of that great military manoeuvre known to the generals as Operation Overlord until it entered history as D-Day. Everyone stared in silence for a long moment. The thought of Alec and Mike’s great-grandfathers and Goss’s father somewhere in the dark heading for Normandy gave them a strange feeling. “It’s another seam in time,” The Doctor said. “Do we head for it again?” Goss asked. The Doctor looked around and smiled as he saw his two young friends. The Doctor smiled warmly at her and vaguely wondered what he could possibly do to shake her faith in him. He remembered once having to do that to Ace, for reasons that she came to understand afterwards. But he had felt like a ratbag for doing it to her. The hurt in her eyes had been heartbreaking. He would hate to see Wyn hurt that way. “It’s a long story,” Alec assured him. “I don’t think The Doctor would LIKE that,” Jasmin said, though SHE liked the idea a LOT. A film about a hero like The Doctor - especially if he was played by Mike Norton. SHE would go see a film like that. Jasmin and Alec looked at each other and smiled a secret smile. How could they begin to answer those questions. They didn’t even KNOW the answer to the first two, and the third wasn’t their secret to tell. As for the last question, it was a story they doubted they could EVER share with anyone. They watched on the viewscreen as they went from dark night to a bright afternoon sunshine with a completely different fleet of ships coming up the channel. “And they have cannons,” Wyn observed as they once again came under attack. She ran to the TARDIS door and saw Captain Goss ordering his people to get the ship turned into the headwind. As they did she saw another of those strange demarcations between day and night. They sailed straight for it. “Oh, my,” she heard The Doctor say as they passed into a quiet and battleship free night. “This I HAVE to see.” He took Wyn’s hand as he stepped out of the TARDIS and guided her to the port side of the ship. “No, not a battle this time. Nothing to worry about at all. Not for us, anyway.” The Doctor looked out over the sea and Wyn followed his gaze. She saw a ship maybe a couple of hundred yards away that seemed hauntingly familiar. A big steam liner with four great funnels. It was brightly lit against the darkness and it looked beautiful as it sailed on through the night. Wyn tried to work out why the sight of it made her feel sad. “What’s the date now?” she asked The Doctor. “It feels funny, to have actually SEEN it,” Wyn commented. She shivered. Whether from cold or something else, she wasn’t sure. The Doctor put his arm around her comfortingly. Before he turned away, telling her they should get a warm drink below deck, he raised his hand in silent salute to that other ship as it continued its fateful voyage. Alec and Jasmin were still chatting to the film folk when they came into the mess hall. They all looked up at The Doctor and he read the guilty expressions on their faces. Brian looked at him in surprise and opened his mouth to ask a question of Jasmin and Alec. “What’s a thermic torpedo?” Brian asked. The Captain made an educated guess and didn’t like it one bit. “We have to abandon my ship?” The Captain looked upset about that. The Doctor could understand that. He would feel the same if his TARDIS was in that sort of danger. But saving lives came before saving boats, even one as beautiful as the Halcyon. Captain Goss looked around at the people in the mess hall. The crew were ordinary people who made a living taking film and television crews out to sea on old fashioned boats to make authentic looking action scenes. Their idea of adventure and danger was sailing into a bit of bad weather. The rest of the people on board were actors, stuntmen, camera and sound men, make up artists, hairdressers, costumers. They MADE adventure happen as an illusion for the silver screen and talked about it on the DVD commentary. But he thought he understood The Doctor’s point. “Go for it, Doc,” Brian Worthing told him on behalf of his own people. The Doctor turned to him with a gleam in his eye. Those who had not seen the inside of the TARDIS yet were puzzled by what was going on. The Doctor smiled as he heard Brian Worthing trying to explain to his own people about dimensional relativity. He was nearly right - a VERY fertile imagination, indeed. Everyone sat in a ring around the edges of the console room. The Doctor looked around and saw that they were all watching him expectantly. He turned to his console and looked at the readings. He grinned as he saw them pass into yet another time zone. The date had to be another historical coincidence. But this time, at least, the waters around Plymouth were quiet. The action was further down the coast around Kent. He moved to his communications console and sent the signal he knew would attract the attention of those causing the time storm that had tossed them all around naval history. Almost immediately, the TARDIS began to judder and shake as if something was vibrating underneath it. Captain Goss jumped up and ran to the door. “Don’t,” The Doctor warned him. To The Doctor’s surprise the door opened. He looked at the console. It really did have a mind of its own sometimes. It ought to have locked tight against any danger. Did that mean there WAS no danger? Was the TARDIS telling him it was ok? “Everyone else stay put for the moment,” he said as he followed Goss. It was daylight again in this time zone. A brisk, cool day in October, as The Doctor knew from his last reading. He saw Goss by the portside railing and joined him there. What he saw amazed even him. The Halcyon was rising up out of the water. Its hull was caught up between two raised sections of what was clearly a much bigger craft underneath it. “What is THAT?” Goss asked. Behind him everyone else had come pouring out of the TARDIS to look. “So much for stay put!” The Doctor muttered as his friends reached his side. They all watched as the bulk of the alien craft emerged from the water. “Alien ship?” Wyn asked him. But he didn’t need to answer that. It was very definitely alien. It was like a giant flatfish apart from the two raised sections. The Halcyon was caught in them roughly midway along the back of it. It was a sort of greenish blue shade that shimmered as if it was a part of the sea. Wyn wondered if it was something to do with camouflage. And it was BIG. The Halcyon looked like a rowing boat in comparison to it. “And they are not usually hostile,” The Doctor added. “I don’t think the things that have happened to us were deliberate.” He watched as a door opened in the raised fin of the Callusthusian ship. He alone knew what to expect to emerge. His TARDIS companions were ready to expect just about anything. The rest of the Humans around him all took a step back as five Callusthusians emerged, one at a time, from the doorway. They were definitely alien, too. They were something like eight feet tall and as thin as a normally proportioned Human man who had been stretched. Their heads were elongated and fish-like with gills stretching from the rudimentary noses to either side of the thin-lipped mouths. Their fish eyes bulged in the sockets and their skin was grey-green to match their ship. They were all dressed in long, shimmering robes that resembled fish scales and their hands and feet were webbed. “They’re amphibians. They come from a planet with very big oceans,” The Doctor told those close enough to him to hear. The Callusthusians stopped halfway between the doorway and the Halcyon and looked up expectantly at the Humans who looked down curiously at them. “Captain,” The Doctor said. “You come with me.” Goss nodded to his crew to open the companion gate and drop down the ladder. The Doctor led the way. Above him the rest of the crew and passengers of the Halcyon watched in wonder as he approached the aliens. “How come the alien speaks English?” Mike Norton asked Jasmin as they leaned against the railing and strained to hear the conversation. “I don’t know,” Jasmin admitted. “I think maybe not. But….” She turned her attention to what The Doctor was saying, and what the alien called Gresh Velkar was saying to him. “I… er... um….” Goss looked at the Gresh Velkar and then at The Doctor. He swallowed hard. “The appropriate response is to accept his apology,” The Doctor told him. And that was exactly what happened. Under The Doctor’s expert direction a team made up of the Halcyon’s crew and the technicians of Brian’s film crew, stripped down the Callusthusian ship’s engine, repaired it and put it back together again in a few very busy hours. The rest of the unwitting time travellers were treated to Callusthusian hospitality, given food and drink on their mess deck, Humans mixing with Callusthusians cheerfully, and discovering that they had more in common than they thought. When they were done the parting was quite emotional. The Doctor smiled as he saw digital cameras and hand held video cameras and even some of Brian’s film cameras brought out to capture pictures of aliens and Humans shaking hands, standing shoulder to shoulder and waving at the camera, and exchanging souvenirs. Captain Goss was very moved when Gresh Velkar offered him what he realised was a Callusthusian flag and sent one of his people to find a Union Jack to give in exchange. Then The Doctor ordered everyone back on board the Halcyon. Velkar ordered his people to go below decks, and they hung on tight to the rails as the Callusthusian ship submerged and the Halcyon was set down in the water again. There was a disturbance in the water and a lot of wake as the Callusthusians moved their craft from under the Halcyon and then began to ascend again, this time faster than before. When they broke through the water they kept on going, rising vertically into the sky until the great ship looked no bigger than an airliner. The Doctor looked up and smiled and waved. “Good journey,” he whispered as the Callusthusian ship accelerated away. Then he turned and told everyone to get back into the TARDIS. The Doctor just grinned enigmatically and turned to his amazing ship’s controls. They ALL crossed their fingers. The Doctor noticed that Alec and Jasmin made sure they were sitting with Mike Norton who seemed to have become a firm friend to them now. But he needed them more than their screen idol did. He checked his readings again and then set the co-ordinate he had extrapolated from the data he had collected since they arrived in this strange situation. The TARDIS might have been parked, but it had registered its piggy back journey on the Halcyon through the different time zones and he had enough information to work out how to get them back to four miles off Plymouth in June, 2015. He just wasn’t entirely sure if they would get there whole. The Halcyon wasn’t the only ship that was likely to be pulled to pieces if he got it wrong. “We believe in you, Doctor,” Alec told him as his expressoon gave away his concern. He looked around and grinned and keyed in the co-ordinate. It WAS a bumpy ride. The Doctor watched the vortex changing from the red colour that indicated they were going forward as they should be, to blue indicating that they were being pulled backwards again, to green which shouldn’t have been appearing at all. He furiously adjusted settings on the navigation panel and compensated for the extra weight of the sailing ship, wondering if the groaning sounds he could hear were the Halcyon having a rough time of it or his TARDIS engines overloading. And then, suddenly, they dropped out of the vortex. The Doctor looked at the console and then he looked up at the viewscreen. He opened the communication channel and they heard a radio broadcast. The Doctor adjusted the frequency until he found a short wave signal trying to contact the Halcyon. He signalled to Captain Goss who came and took the microphone. He reported that they had a temporary radio fault and asked for the helicopter rescue for the man with the broken leg who was still sleeping it off in the TARDIS medical room. Other than that, he reported, all was well. The Doctor smiled and opened the doors. The Captain ran outside. Again, everyone followed. The Doctor brought up the rear, stepping out into a bright sunny day. He looked up into the sky and saw the vapour trail of a jet plane high in the sky above. Everything was normal for June, 2015. Alec was the last to settle into his seat in Wembley Stadium where they were all soaking up the pre-match atmosphere. He passed hotdogs and coke along the row to everyone. “That’s why The Doctor is a way better hero than some movie star,” Wyn said, loyally. The Doctor laughed and bit into his hot dog. “Had to happen sooner or later. Good luck to them.” He grinned and sat back to enjoy the football.